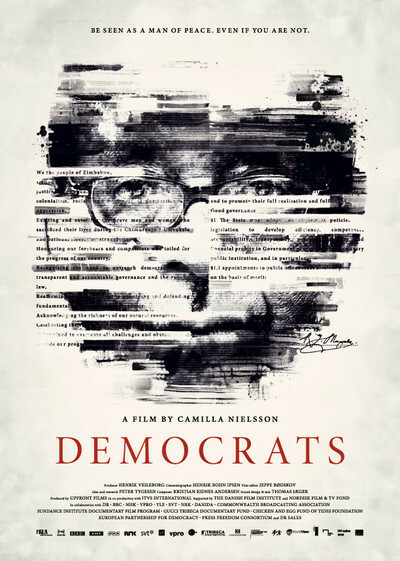 Democrats is a 2014 Danish documentary about the contentious 2008 election in Zimbabwe and the subsequent coalition's attempts to redraft the country's constitution. The film, directed by Camilla Nielsson, has been subsequently banned in Zimbabwe. In an interview with eNCA, Douglas Mwonzora, a lawyer and representative of the MDC-T said that the depiction of violence at various political meetings forced the censorship boards to ban this honest account of what happened behind-the-scenes. Filmed over three years, Nielsson gains seemingly unlimited access to COPAC campaigning and negotiations. While this account is informative, eye-opening and even disturbing in the way misinformation and political tampering can impede constitutional progress, it's essentially the story of an unlikely friendship. ZANU-PF representative, Paul Mangwana, former Minister of Information and MDC–T representative, Douglas Mwonzora, are instructed to carry out the coalition government's mandate to draft a new constitution based on feedback from the people. So begins an arduous process of hosting thousands of rural and urban gatherings across the country to give the people an opportunity to speak. Their task is to gather information and seed it into the drafting of a new constitution for Zimbabwe. However, the process is delayed through political interference, intimidation, violence and transporting additional party representatives into meeting areas. Intended to be peaceful, things break down and an inspirational governmental mission is hampered by false arrests, misinformation, instability and media involvement. Through this journey, Mangwana and Mwonzora are at first pitted against each other, storming to get the best foothold for their political parties. Worthy adversaries, they maintain a healthy respect for one another, deliberating on a shared vision for a free and fair Zimbabwe. This common goal means different things for each of them, as one man tries to preserve the old order and the other tactfully negotiates his way to a more inclusive Zimbabwe. There's something to be said for the nation's sense of humour, for as serious as matters get, there's always room for a laugh or smile. Mangwana is a charming man and you could imagine Forest Whitaker taking on his role of devil's advocate, moving from self-assured smiles to the grave seriousness of a most wanted man. Mwonzora is a quietly confident man, who instead of resting on his party's legacy, is forced to use his lawyering skills in order to navigate a clear path. Their interactions range from affable to heated as they argue on various issues, from political meddling to contentious clauses. Nielsson cleverly pivots the film on this relationship which demonstrates that while their political ideologies may differ, they are still able to get along. You wonder what kind of influence the documentation of their roles may have had on the outcome, since most people behave differently on camera. However, over such a long period of time, the filmmakers must have become like a fly-on-the-wall. This is reinforced by footage capturing meeting violence and the honest expressions on the faces of these men. Being Danish, probably also aided them in representing a much more "independent" standpoint. Although, the translators are each listed as Anonymous in the credits, demonstrating just how unsettled the situation remains. While at face value, seemingly balanced, Mugabe and organised ZANU-PF machinations serve as a constant threat to completing the task of writing a new constitution. Being a South African, the idea of drafting an inclusive and respected constitution echoes the sentiment of the New South Africa, which made this film more personal beyond sharing a border. The notion that two "enemies" can forge ahead and usher new life into a politically war-ravaged country is moving. Having journeyed with them through their many trials and transitions in Democrats, the thought that a suspended peace and justice can be achieved in a situation as volatile as Zimbabwe, is inspirational... even if for a brief moment in time.